Hugh was a strong and smart warrior. 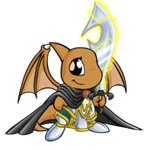 With his keen senses, speedy reflexes and the strength of a thousand Neopets, he was often admired and praised by his fellow combatants. Even Professor Lambert, leader of the Seekers, acknowledged his exceptional abilities, having had recruited him into the guild at the tender age of ten. Many looked up to Hugh. Many respected and adored him. "Well, flying does have its benefits on the battlefield," a friendly Eyrie who had recently been inducted into the guild had told him, "but you're doing pretty well on foot." "Thanos, have you known a Shoyru who couldn't fly? It's practically unheard of!" "Hmm, I can't speak for you, but I'd respect my dad's wishes if I were you." Many warriors claimed that Hugh's father was considered a formidable fighter during his heydays. Hugh had even heard rumors that he earned the nickname, 'The Aviator Knightmare', for his supreme dominance over the skies in battle, but his father had never actually confirmed them. Regardless, it was all the more reason why the Shoyru had to learn how to fly. Not only would he uphold the family name, but he would also be able to utilize the skies for future strategies and battle formations. His father, however, didn't share the same views. "It isn't worth risking your life for," the older Shoyru would often remind his son. Much begging and persuasion didn't change the fact that Hugh's father wasn't willing to teach him. The Shoyru couldn't fathom the reason behind his decision, but he was eager to learn all the same. Hugh pondered deeply for the next several days, weighing the advantages and drawbacks of learning how to fly, but there was almost nothing he could think of that made flying disadvantageous. Finally, he made up his mind and decided to seek help from Thanos. The Eyrie was a little skeptical when he heard the Shoyru's request. "I don't know, Hugh …" mumbled Thanos. "Please, Thanos. It's not entirely for fighting purposes," Hugh reasoned. "I am a Shoyru after all, so it's natural that I should know how to fly, don't you think?" Thanos sighed but agreed to help his companion. Hugh couldn't be happier; he had decided that he was going to surprise his father on his next visit with a new skill. The lessons weren't easy though. Despite being a fast learner, Hugh found it difficult to hover in the air for more than a few seconds. "Just a little faster. Maintain your consistency, Hugh." Thanos' instructions were clear-cut and he guided the Shoyru well. By their sixth lesson, Hugh had gotten the hang of it. "That took a little longer than I expected," Thanos commented by the end of their lesson, "but hey, you can fly now!" "Thanks so much, Thanos!" Hugh exclaimed delightedly. "It's my treat the next time we go out for lunch." "Sure thing." Thanos turned to go, but turned back at the last moment and hesitated. "Just … don't get it trouble with your dad, okay?" "Yeah," Hugh promised with a smile. It was late in the evening by the time Hugh's lesson was over. He was exhausted, so he headed back to his quarters after having dinner instead of hanging out with the other guild members. However, his elation kept him from falling asleep. After lying on his bed for some time, the Shoyru decided to pen a letter to his father. He didn't reveal any details; it was just a simple letter informing him to 'expect a pleasant surprise' on his next visit. After tying the letter to the leg of a Crokabek and watching it blend into the darkness, Hugh returned to sleep. He was definitely going to make his father and his deceased mother proud. Several weeks passed in the blink of an eye and soon, the festive month had arrived. Fortunately, the guild didn't participate as actively in skirmishes at the site of the Obelisk during the Month of Celebrating due to various reasons, so the Shoyru took the opportunity to visit his family. By the morning of the second day of the month, Hugh had packed his belongings and was ready to go. It took about half an hour to reach the Tyrannian village on foot, and another half to Hugh's Neohome. To test his newly acquired ability, the Shoyru heaved his heavy backpack over his shoulder and began flying on his way back home. He focused more on his balance in the air rather than taking in the sights of Tyrannia. As Hugh expected, he was able to keep at a moderate and steady pace during the entire journey. It would be a surprise had he failed; the hours spent practicing on flying leading up to that day would have been a waste then. Upon arrival at his Neohome, Hugh set his bag down and took a deep breath. Excitement bubbled in his chest; it was now or never. He rapped on the door three times and moments later, the door opened to reveal a young and pretty Shoyru. "Hey, Sara pumpkin," Hugh greeted his sister, squatting down to tousle her hair. She jumped and latched on to him with a tight hug. "Missed me, did you?" "You bet I did!" she squealed. "Daddy told me that you had a surprise for us!" "I sure do, pumpkin!" he assured, smoothing down her messy hair before carrying her on his back. He couldn't contain a chuckle; it was amusing to watch his sister get so eager over everything. Tilting his head up, he asked, "do you want to find out now?" "Yes! Yes!" Sara clapped her hands and her round blue eyes looked hopefully at him. "Hold on tight 'cause here we go!" On the last word, Hugh faced forward, spread out his wings and took off into the air. Once he made sure that Sara was secure, he circled their Neohome several times, soaring high then gliding low, turning left and right, and even flipping in midair once. The younger Shoyru's joyful shrieks disrupted the tranquility of the neighborhood and caused the Pteris who were perched on a nearby tree to scatter. Sara wasn't the only one enjoying herself. Hugh relished the cool touch of the breeze on his face. It was soothing yet exhilarating and gave him a sense of freedom, something which he had longed for after spending so much time cooped up in a guild. In fact, he was having so much fun that he didn't realise a figure watching them from below until Sara pointed it out to him. "Daddy looks really small from here!" She let out a giggle. Sure enough, Hugh spotted the unmistakable figure of his father. "We're going to go back, okay, pumpkin?" As the Shoyru landed on the veranda, he noticed that his father was wearing a stunned look on his face. So much for the surprise, he thought to himself, a little dampened by the turn of events. He could still share his learning experience though. Before Hugh could utter a word, however, his father turned on his heel and disappeared back into their Neohome. Sensing something amiss, he lifted Sara off his back and persuaded her to return to her room. She must have felt it too, for she grabbed his paw in response and gave it a reassuring squeeze before doing what she was told. "I thought I had you convinced," Hugh's father began as soon as the door clicked shut, "but it doesn't seem like it." "Dad, I can explain -"
"As with any other kid, isn't it?" He cut the younger Shoyru off as he strode to the kitchen to make himself a cup of coffee. "Hugh, I've reminded you over and over again how dangerous the guild was, but you still decided to join them and remain there. That, I forgave. I didn't bother as long as you didn't take to the skies." "But what's so dangerous?" Hugh retorted. "It's just a vast blue expanse with so many other Neopets flying around. It's not like it's going to kill me." His father immediately stopped stirring his hot beverage and whirled around to face Hugh. Hugh instantly regretted what he said; his father stood frozen to the spot, visibly shocked and hurt. "I - I'm sorry, dad," the Shoyru stammered as he tried to break the silence. "It's just that …"
"I'm not the Aviator Knightmare, y'know." "It was your mother. She was a brilliant fighter until … a former guild member betrayed her." Nonplussed at the new bit of information, all Hugh could do was listen with his mouth open. "That member was jealous of her," his father continued. "He allied with an enemy guild one day to ambush and take her down. She was heavily injured but she made her way back home. I sent her to the hospital and the doctors tried their best but …" He watched the curlicues of steam rising from his cup and sighed heavily. "Then, the illness you told me about, was that all a lie?" The older Shoyru nodded. "I'm sorry, son. I didn't know how to break the news to you and Sara." "That doesn't explain why people called you the Aviator Knightmare." "I didn't want that betrayer to know about your mum. Luckily, she'd always wear a cloak and mask and gloves, so I took on her identity, carried out guild missions for a couple of weeks before announcing that the Aviator Knightmare would retire from her post. It really put him on edge, which is why," he said, setting his untouched coffee cup on the table, "I don't want you to learn any traits which would associate you with your mum." It took a while for Hugh to process all the information in his mind. Once he did, though, he was at a loss for words. He hadn't known anything; he joined the Seekers because he was keen on acquiring more information and learning new skills. He didn't even know who the betrayer was. "What was the betrayer's name?" Hugh inquired. "What?" he exclaimed. "Max? You mean the guy at the Sway with a scar down his left cheek?" "If my memory serves me right, yes." Now it was his father's turn to be shocked. "Are you serious?" "Yeah," Hugh replied, "he didn't survive the skirmish against the Brute Squad." It was still a little heartbreaking even though he was the cause of his mother's passing. "Oh, I see." He picked up his cup, gulped down half of his coffee in one go and set it back down again. "Well, in any case, be careful of everything you do, Hugh, regardless of Max. Your mother and I want you to live a safe and happy life, well away from any danger and regrets. Promise me this." "I promise, dad," he assured him with a gentle smile, "don't worry." The fireplace burns dimly, the low flickering flames casting a soft, orange glow that barely helps to illuminate the room. Hugh stands by the hearth, somewhat tending to the fire by poking absent-mindedly at the cinders. Twenty minutes have passed, but the outcome of a meeting has yet to be reported to him. After another couple of minutes, the Shoyru strides to his oak table, having given up on waiting for the news. Just as he sits himself on the leather chair, the door to his office swings open and in barges an Eyrie. "The truce was successful, chief!" The Eyrie announces cheerfully. "Cut it out, Thanos. How many times do I have to tell you to stop calling me chief?" Hugh chides him lightly. "Okay, chief," Thanos replies, oblivious to his force of habit and Hugh's eye roll. "Anyway, I cannot believe that the negotiations went so smoothly! And it's Syashka we're dealing with!" "Well, I see no reason why she wouldn't agree to a fair pact," Hugh muses. "Are you kidding me?" The Eyrie cries, clutching his head in disbelief. "She's the last person in Neopia you'd expect to give up on wars and destruction. You tamed a beast, chief!" "It's not that hard," Hugh answers sheepishly, a faint blush creeping up his cheeks. "Besides, I'm only handling a small part of the plan. Professor Lambert decides the rest." "Well, in my opinion, only the Chief Strategist could have accomplished such a feat." Stifling a yawn, he stalks out of the room and wishes the Shoyru goodnight. When Hugh no longer hears the Eyrie's footsteps, he picks up his quill and proceeds to compose a letter. It's been a long time since we've last communicated. I'm doing really well in the guild. I'm no longer fighting out there in the battlefield, just like you wished. I'm actually the Chief Strategist now, and it's a lot more difficult than I thought it'd be but Professor Lambert thinks that I'm the most suited for the role. It's pretty much a safe job because all I have to do is come up with as many different strategies as possible and leave it to the higher-ups to do the actual planning and talking. Also, I've even got Syashka Dronard to agree to a temporary armistice. That kind of settles the dispute between mum and Max, don't you think? Other than that, I've just got tons of paperwork and I occasionally fly around outside for a breather. Don't worry, it's nothing dangerous. I'm just flying like how any other normal ol' Shoyru would. I'll definitely come and visit you both one day. In the meantime, I hope that you're enjoying yourselves in a better place. With a flourish, the Shoyru ends his signature with a paraph and roles up the sheet of parchment as he goes back to the fireplace. He tosses it into the fire, watching the tips of the flames engulfing their new source of fuel ravenously before gradually dying down, leaving the ashes to settle heavily at the bottom of the firebox. As Hugh watches on, he ponders about his life. He knows that he will follow the fate of that parchment someday, reduced to nothing but a memory. But until then, he'll carry out his promises and continue to make his parents proud.